Over three years ago, Patrick Lawrence accepted an invite from his friend Wesley Owens to attend a birthday party at Cigar City Club (CCC). For a couple of months following, he visited the club every day…that’s right 7 days a week! He quickly noticed that while other cigar venues try to compete with CCC, there really was no comparison. Patrick delights in the ambiance, mature crowd and opportunities to network in a relaxed atmosphere that summons everyone to let their guard down and really connect. During his visits, he has formed new and strengthened existing bonds with others that extend even beyond the club. A couple of membership perks that stand out for him are the ability to bring wine into the venue from his personal collection, to always having a seat waiting for him in the members only section. He looks forward to attending the member centric events as well that allow him to catch up with others. His yearly highlight is attending the themed Christmas party that brings in the holiday spirit and affords patrons a collective opportunity to give back to the community. Patrick is truly the ultimate connector, he enjoys bringing folks together especially when he learns they work in similar industries. Many concur that Patrick knows everyone, however, he firmly believes that “it’s not about who you know, instead who knows you.” It’s important for him to introduce himself to people at every event or establishment he encounters. Creating a sense of community is natural to Patrick as he was born into one as a triplet and brother to a set of twins. In fact, he jokingly finds it odd that folks are born via a single birth. He’s a native of Jamaica, raised on a farm and came to the states at eight years old. Perhaps his upbringing is why he also takes pride in keeping things in order, which he admits is a form of an obsessive-compulsive disorder. Don’t be surprised if you find him taking ownership of what some may consider the “small things” — fixing something disheveled or even tidying up a bit often while in his pristine suits! He may also have a camera in hand to capture an event for he enjoys dabbling in the art of photography. Patrick’s recurring presence, extensive network and acts of servitude have folks regarding him as the Mayor, Governor, Manager or even Owner of every place he goes! He was recently awarded with the “Brother of the Leaf Award” for his contributions to the cigar community during Atlanta’s Cigar Week. Beyond this acknowledgement, his brotherhood is displayed proudly with him every day as a member of Omega Psi Phi where you will always find some paraphernalia representing his fraternity on him. 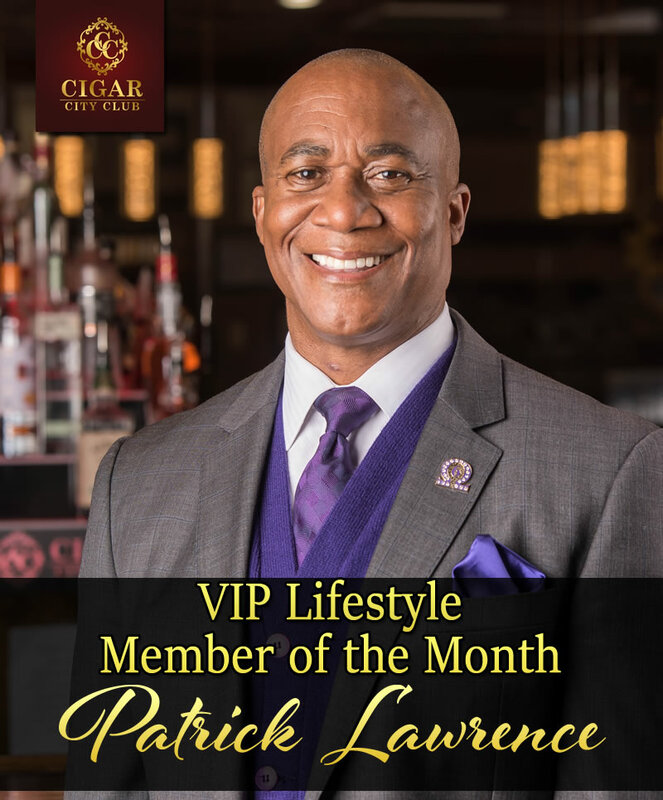 Congratulations Patrick for being Cigar City Club’s VIP Lifestyle Member of the Month for November which also kicks off an even bigger celebration for you on the 1st …. Happy Birthday!